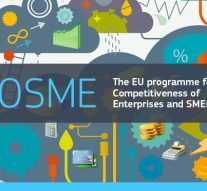 The Executive Agency for SMEs, the EASME, launched a new call for proposals aimed at strengthening the competitiveness and the sustainability of European companies. The call, which is particularly focused on SMEs, will support consortia promoting innovation-oriented public procurement with the scope to significantly increase the proportion of SMEs that have access to the public procurement market. Encourage cooperation between public buyers to promote the use of public procurement to contribute to the development of innovation. Use public procurement as a mechanism to pilot innovation in areas of strong public interest such as, for instance, clean energy (contributing to Paris targets for fighting climate change) or healthcare. This will in turn encouraging innovative EU companies, in particular SMEs, to develop new solutions to address societal challenges. Link and establish synergies with research and innovation projects funded by the EU (via Horizon 2020, COSME or EU funding programmes) whenever possible. This call for proposals aims at setting up consortia of public buyers from at least two eligible countries. The consortia must design and implement a public procurement for innovation (PPI) action. The public buyers in the consortia will procure the identified innovative solution(s), possibly in a joint manner, in full compliance with EU and national public procurement rules. Applicant consortia must demonstrate that the envisaged procurement solution(s) will be new to the public buyer, that the solutions are not yet available on a large-scale commercial basis and that the solution(s) can be of interest to public buyers in other EU Member States. The project’s duration must be between 36 months and 48 months. In exceptional cases, and if necessary for the completion of the project, the duration of the project may be extended for 6 months. This extension may be requested by the project coordinator during the course of the project and is subject to compliance with the Grant Agreement and EASME approval. The total budget earmarked for the co-financing of projects is EUR 4 000 000. EASME expects to grant projects co-financing between EUR 800 000 and EUR 1.5 million. EASME expects to fund 3 to 4 proposals. The deadline for submission is 11 December 2018 at 17:00 hours (Brussels time).